I’ve been collecting some silver pieces this year. Mostly at garage sales and thrift stores, normally paying less than $4.00 for a piece. 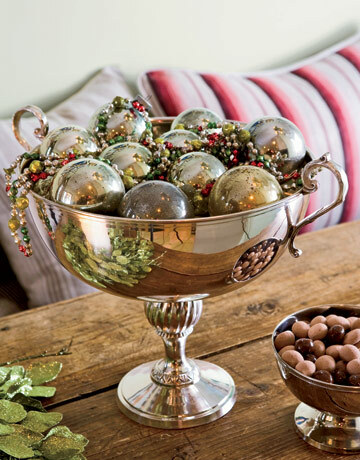 So when I started seeing lots and lots of silver in the Christmas decor magazines I was excited. 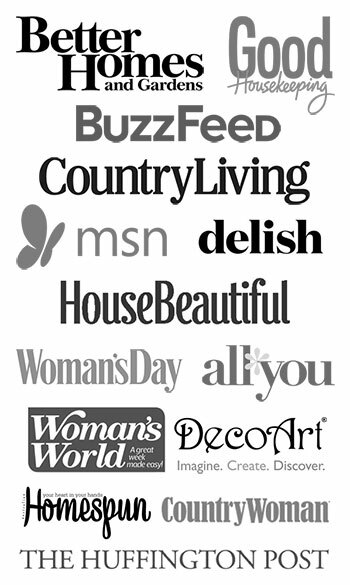 All images courtesy of Country Living. Now, if I was just starting out in life and didn’t already have a ton of red, white and green Christmas decor in my basement, I would definitely go all silver. There’s just something about the smooth, sleek, gleaming surface that calls to me. But, alas I can’t just chuck 30 years of Christmas decor and start anew. 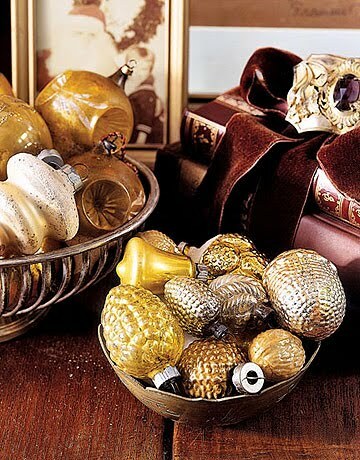 So I think I’ll casually bring some of my silver into my Christmas decor this year and try to mix it in with my brighter traditional colors. 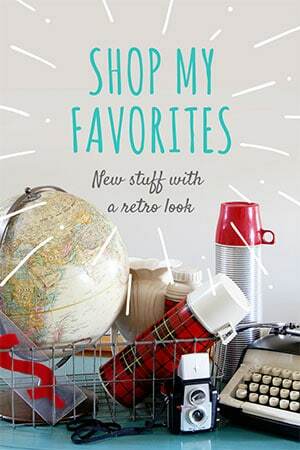 I am linking with Debra at Common Ground‘s Vintage Inspiration Friday. Yes, I know it’s Saturday, but better late than never. 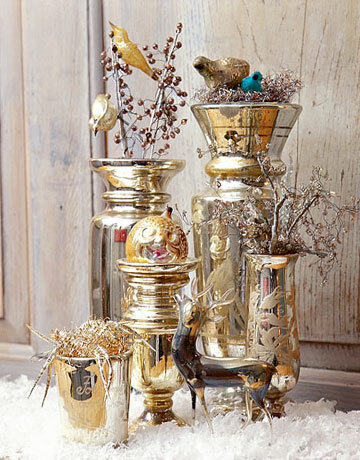 I look forward to seeing how you incorporate your silver into your holiday decor. I know- Isn’t that the truth? What we have collected over the years, and means so much to us in many ways, pales in comparison to some new loves? Last year, I kept some of my “old stuff” in storage and beefed the rest of it up with things a bit more to my taste today. I, too, love the silver. It’s funny-I loved it when I was first married and then kind of moved away from it…and now I love it again. Such beautiful eye candy…love that kitchen window display! 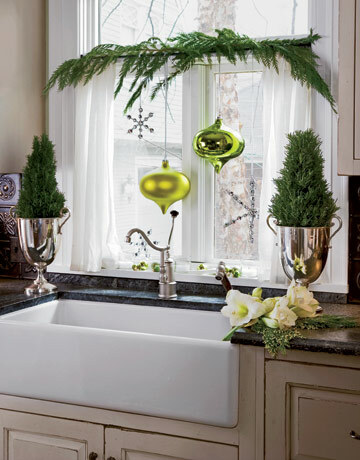 How pretty…the li’l trophy trees next to the sink are really fun! I had just finished going through a few of my mother’s Christmas balls, wondering if they were really old or just made to look old. I sat down to check out some blogs and my goodness but here on your blog are a couple of the balls I was looking at. 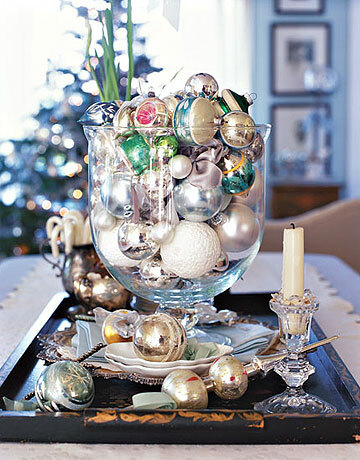 I love the way you put them in the “vase”… Now I know exactly what I’m going to do with the Christmas balls now. Thanks!! I love the silver look too. Nice. Fantastic pictures, I really like the last one. Can’t wait to see what you come up with in silver displays. Just beautiful! I especially love the kitchen silver! Can’t wait to see what you do Pam!! Hi, I recently found your blog and have gone back and read through all your posts. Just wanted to let you know how much I enjoyed it. Several years ago I weeded out the old colourful ornaments and went with all white and silver. I add to them each year. I tend to get easily sidetracked by all the pretties this time of year but by having an all white/silver tree keeps me focused when I want to add something new. We’ve moved a lot in recent years and the all white theme has always worked no matter what the colour or decor was in a previous home. I had to redo my comment oops. Anyways what I wanted to say was i love these photos and love the idea of a silver theme Christmas! Unfortunately my son would be so unhappy he is still little and loves all that colour! I love your new photo header! Hi Pam, I have that tray in the third photo. Obtained from a yard sale, like your silver, for $5.00. I am trying to pull it together here but I have every color under the sun…did not care a hoot about what was on my tree last year as we were buying a house. Your silver will look great with colored decorations also. Silver makes it all look fab! What gorgeous, gorgeous inspiration photos. 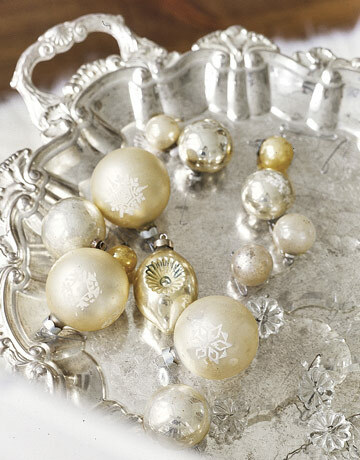 I love silver – especially around the holidays. Beautiful! I’m a new fan of silver… can’t get enough of it! Do you polish yours or leave it tarnished? Stop by my blog and link up to my party!